Very poor service! specially the courier. Very disappointing.. We indicate the contact number in the form yet your courier not called the receiver. What's the purpose of writing of having a contact number in the form? LBC please provide Load for your Courier so that they can contact the receiver. Load is not an excuse. It's not our problem anymore. We want good service from your company. lbc tracking number 87102439886. *Went to the concerned LBC branch and they just updated their system to ask feedback. *Contacted using FB messenger but my messages were just seen, no reply from LBC. *Contacted LBC hotline 8585999 and was put on hold/queue for 45 minutes. *Contacted Lazada since this is a Lazada returns but they just informed me that they will follow-up this with their returns department. 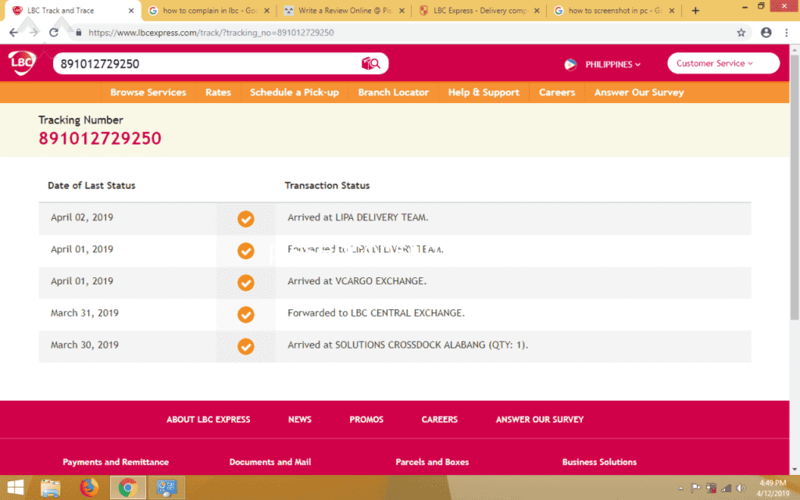 * LBC tracking last update was on March 28, 2019 and its already April 11, 2019. What kind of service is this!!!!!!!!!!!!!!!!!!!!!!!!!!!!!!!!!!!!!!!!!!!!!!!!!!!!!!!!!!! I know that the delivery thingy is not that easy but Im not happy anymore I've been waiting my item for few days.My supplier already contacted me if the item is already delivered and I said NO. Your always saying that our office is closed even though it is not. And just later you said that I am not present in the said address. Could you please deliver it by morning tomorrow. My tracking number is 173093252655 And my address is Qallity Inc 3rd & 4th floor JBT Building Corner BBB - Burgos Sts, Bacolod City, 6100 And if you want some landmark our office is near the STI West Negros University In front of the Angel's Burger.. Thank you.